The Tate Gallery 1965 catalogue stated that The Schoolboy (no. 42) belonged to the artist and had been exhibited as The Schoolboy (no. 4) in London Artists Association (2) 1931 and as Boy in a Blue Jersey (no. 16) in Redfern Gallery 1942. 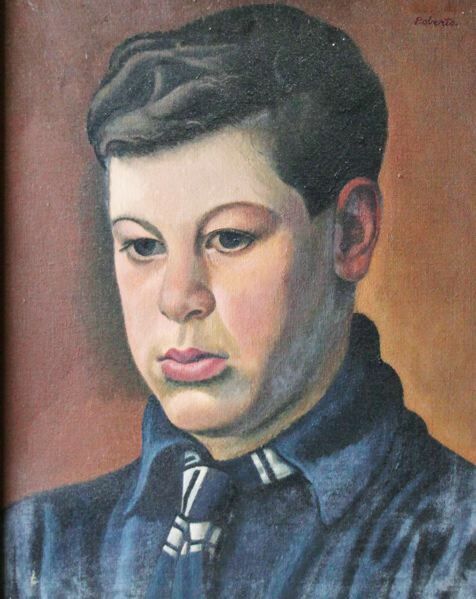 However, the LAA picture had been bought by Sir David Scott in 1931, and Portrait of a Boy c.1929 seems a much better fit for Boy in a Blue Jersey, so there appears to have been some confusion. The Reading 1983 catalogue identified Paul Rimmer (no. 3) shown then as no. 42 from Tate 1965, and it has been assumed that this was correct and that the picture remained with the family after that and is this, the only portrait of a youth who is not obviously John Roberts that was owned by John when he died in 1995.